When I previously played at Castle Bingo I was very unlucky being very close to a win so I wanted to check it now with a new name - Bingo Cheers and see if it has become more generous to me. Maybe it was because of the weather but I didn't feel chatty so I focused only on bingo. 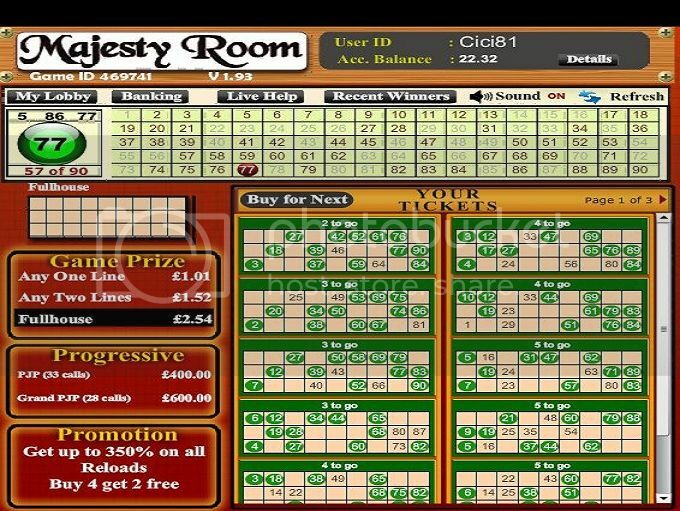 I entered Majesty 90-ball room, I bought 4 strips and I got 2 for free. The game has already started, but since it was way to slow for my taste I left the sound on for a while and started tidying up my room. How surprised I was when I realized that I covered both two lines and fullhouse! These were two small wins that additionally I had to share with three other people but, at least, my balance went up a bit and it was a good start. I stayed in the same room since it was very convenient for my weekend room cleaning. I couldn't remember the last time that happened but I had back to back wins; in my second game I won £2.54. By that time, Cheers Bingo had already got me cheering and started turning into my favorite bingo site. I stayed in the same room for a few more games and I had another small win of £1.56; a few times I was very close to winning some more games but I can't be unhappy after all. I only wish that every time I clean my room, I earn something. Unfortunately 80-ball room was empty so I couldn't test my luck there; I didn't feel like playing slots and I finished cleaning the room so it was time to take a shower and have some rest.